Virtual reality is perceived as the next “big thing”, as a new way of how people will play games and consume multimedia content. Maybe it will be knocked down by the need to wear glasses (as it happened with stereoscopics 3D), maybe it will be knocked down becouse it forces people to move (as it happened to Kinect). Anyway, VR is here, developers are focusing on it, and therefore I’m focusing on it as well. A few days ago I had a opportunity to visit the Audio Video Show 2016 in Prague. 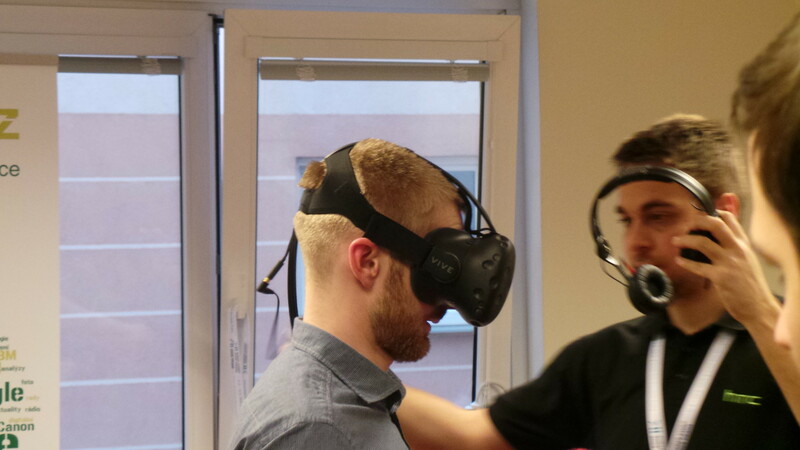 The aim of the visit was clear – the exhibition provided a unique possibility to try probably the best current VR headset, the HTC Vive, before the official release. Some time ago I had a opportunity to test also the Samsung Gear VR and I must admit, that compared to Vive it is a mere toy. The difference in capabilities and quality if tracking is incredible – something like the Hubble Space Telescope vs Kaleidoscope. The HTC Vive headset has a pair of OLED displays 1080×1200, working with a refresh rate of 90 Hz. Headset is connected to a PC via three cables – USB3.0, HDMI and power supply (at the Prague event a fourth cable for headphones was used, I’m not sure why they didn’t pass audio over HDMI). Headset is using traditional inertial navigation system (accelerometer / gyroscope / magnetometer) for the head tracking. On top of it, Vive brings its own localization system for determining absolute position in 3D space. The system is based on a pair of static light emitters, which project rotating laser line into the space. As HTC Vive headset and all its accessories consequently can passively capture projected infrared light and estimate its location by evaluating timing of captured light. This system (called Lighthouse System) is what differentiates Vive from it’s competitors – and what makes it significantly better. But back to the impressions from testing. Within the area of ​​about 3×3 there was a possibility to test the headset along with a pair its controllers on a few demonstration applications. 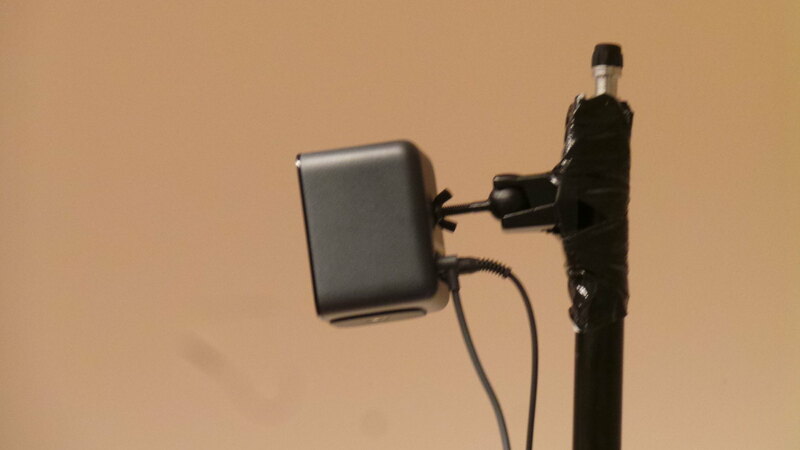 The headset is relatively light (although you feel some burden on the head). It has no problem with dioptric glasses, although putting headset on is obviously little bit more complicated. Screen door effect is totally negligible, basically, is visible only in the “starting room” which is clean white. Quality of position and orientation tracking of the headset is perfect and significantly contributes to the total (good) impression from virtual environments. Quality of tracking of controllers position seems to me subjectively worse (I think they lack control inertial navigation part, but just speculating). Physical controllers which you hold in your hands are transforming to various tools or weapons in a virtual environment, following requirements of specific applications. Although a impression is good and use of controllers is intuitive, there was noticeable a constant vibration on virtual instruments. Estimated controller position has probably a few millimeters deviation. Accuracy is also depending on the position in which you hold controller – on how many infrared receivers can currently see how many Lighthouse stations. Sometimes controller produces a twitch quite perceptibly, and you felt like with the Alzheimer’s. In general, HTC Vive is undoubtedly the best current VR tool. The virtual world is able to trick the brain very well and some demo scenes seemed to be close to what was offered the in the Matrix. Only haptic feedback was still missing. The most people experience the biggest confusion actually after removing the headset and focusing to that little presentation room in which all the vast desert or underwater scene took place. “Welcome, to the real world”. Good info. Lucky me I reach on your site by accident, I bookmarked it.